Always on the lookout for new talent and keen to drop in on artisanal production, we keep revisiting certain spots and tracking down new ones. At Erode, a city in the state of Tamil Nadu, India, we are deeply engaged with denim production, but we also interact with more local places. In addition, we have travelled to the Philippines, Bali and further. The range of weavers that we have encountered is truly astounding. Some simply inspire and others may be able to supply just what you need, through us or in collaboration with us. The closer to home the better. Visiting a block maker in Erode together with student designer Yashdeep Suhag. Whilst for a period of time demand may have slumped, increasingly block printed pieces of garment are much treasured. Block printing requires great human effort and time and finesse. It leaves a personal mark in a way that a machine never could. When we, at The Colours of Nature, confess to be interested in the entire cycle of a garment, it does not end with receiving the blocks and printing. We want to know the origins also of that art. 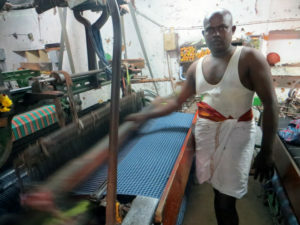 Handlooms may be threatened by extinction, and perhaps the same can be said for ‘vintage powerlooms’. As it is our habit to visit suppliers and prospect suppliers alike, here such a vintage loom set to work producing woven fabric out of our natural indigo fermentation process dyed yarns. We are not only keen to protect our planet, but also take great pleasure from keeping ancient knowledge and sometimes ancient apparatus alive. Scouting out the best for our customers we often end up igniting our own minds. One study trip took us all the way to see the T’boli tribe in the beautiful Lake Senu, Philippines. 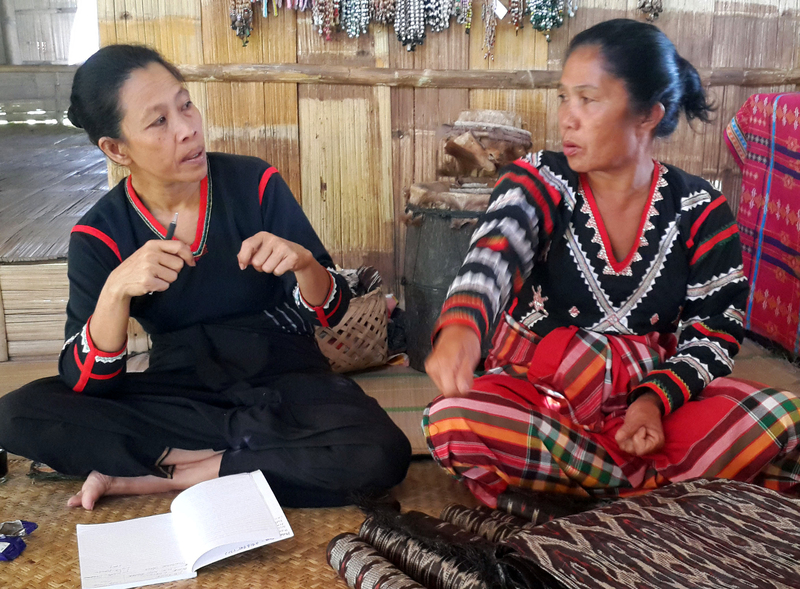 We wanted to gather research and document mainly their use of dyes and were amazed by their work with the Abaca fibre. The plant belongs to the banana family and the particular technique is called t’nalak. Designs are dreamed and handed down through generations. Of course our particular interest was in the dyes and in a plant called Morinda citripholia. Also linked to the Kotpad Orrisa tribe, the dye is brownish-purplish. Indeed, this trip helped us better understand the Turkey red process.